Navarre is an unincorporated community in Santa Rosa County in the northwest Florida Panhandle. It is a bedroom community for mostly U.S. Military personnel, Federal Civil Servants, local population, retirees and defense contractors. Due to its proximity to Navarre Beach and its four miles of beach front on the Gulf of Mexico as well as the Gulf Islands National Seashore, it has a small, but growing community of nature enthusiasts and tourists. 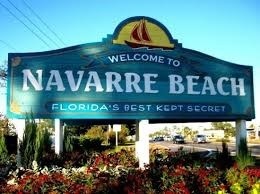 Navarre is about 25 miles east of Pensacola and about 15 miles west of Fort Walton Beach. The community is roughly centered on the junction of U.S. Route 98 and State Road 87. It is part of the Pensacola–Ferry Pass–Brent Metropolitan Statistical Area and is known for the untarnished natural beauty, swimming in the emerald colored water, having a picnic on the beach or in the county park which is located directly on the Gulf of Mexico. Residents and visitors alike enjoy riding or jogging on the several scenic bike paths.